Marriott Hotel on Fayetteville Street. I recently was having a conversation about downtown Raleigh hotels with some out-of-town coworkers. That got me thinking that it’s a good time to take a look at the current and upcoming hotel options to see how things are coming along. This is more of a wrapup post and I don’t have anything new to share. Here’s the TLDR. Let me know if I’m missing something so we can make this list complete. 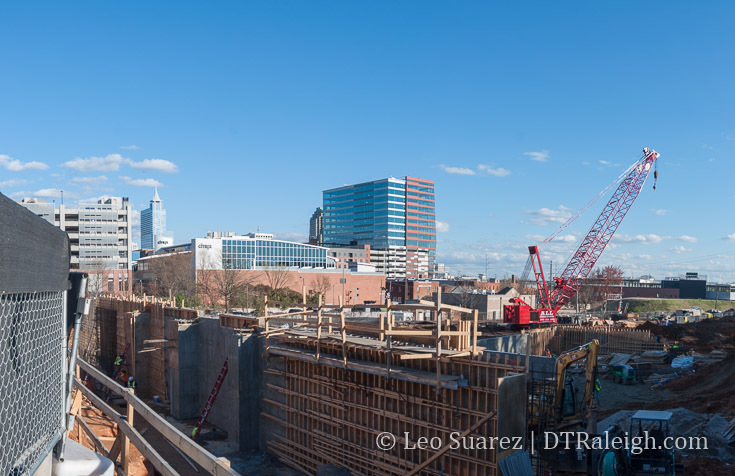 Sir Walter Raleigh building sale, developer hinted at a possible hotel convert. Of the currently open list, the Residence Inn opened as recently as Fall 2017. 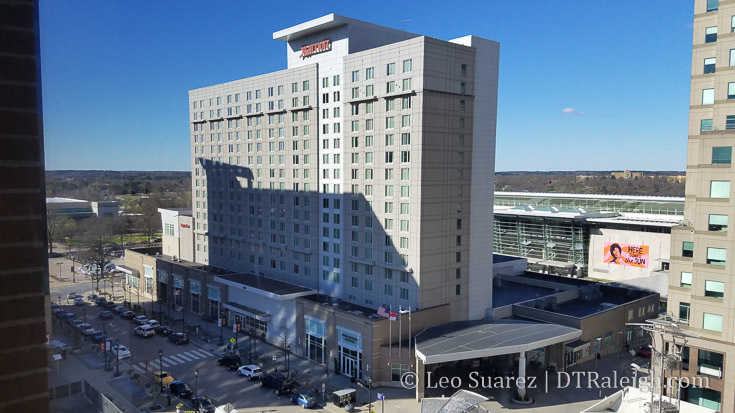 In the last ten years, we’ve watched the Marriott and Hampton Inn go up. Can any readers date the Sheraton and Holiday Inn? Days Inn? They predate the blog as well as predate the downtown Raleigh revitalization of the 2000s that came from the Livable Streets plan of 2003. Construction of The Origin Hotel on Morgan Street. March 2018. Across the street from One Glenwood is the construction site, seen above, for the building’s parking deck. Plans call for an Origin hotel on top of the deck. I put this in the Under Construction category but I certainly could be wrong as the parking deck is certainly underway. I’m not sure if the hotel may come later or crews are planning for it now. 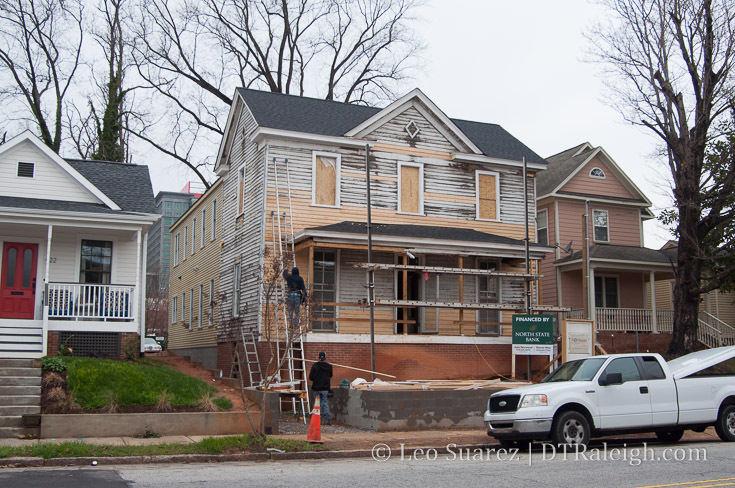 Renovation taking place at Guest House Raleigh on Bloodworth Street. March 2018. I know that I’d love to see boutique hotels popping up around the periphery of downtown Raleigh so am excited to see Guest House Raleigh come along on Bloodworth Street. If successful, hopefully, others try their own take on the smaller, more personal stay in downtown. I think City Centre (301 Hillsborough) is as dead as the Edison office tower at this point. The Holiday Inn (or Clarion Hotel or whatever it is branded as – the round one) was built in 1969. Sheraton was built in 1982. It does seem like momentum has stalled on a lot of those projects, especially the Hilton and Courtyard. I wonder if the Residence Inn has had trouble getting booked and/or if Convention Center bookings are slowing down. Maybe the developers of these projects are holding off. I will say it’d be nice to get rid of that ugly Enterprise Rent-A-Car and old garage at McDowell and Davie, so hopefully things start picking up this spring. I’m going to guess that office and conventions drive hotel stays. We’re not a tourist town so it would be interesting to see the number of hotel rooms correlating to the amount of downtown office space. I THINK I saw somewhere that the convention centet is doing good but it’s basically flat right now. Apparently Apple is also searching for a new east coast location. They list the NC triangle as potential candidate for their new campus. I like how The Willard will be offering condos available for purchase. Thats something new to downtown. I also like the thought of more boutique hotels popping up. The Sir Walter will not be converted to a hotel. HUD will not allow it. It is going to be renovated however. @Alan – do you know the reasoning for not allowing to convert back to a hotel? What will it be renovated into? HUD won’t have anything to do with the decision by 2020. They don’t own the building. It’s privately held. HUD can’t dictate whether a private entity can/can’t redevelop a private building. There are rules that are typically more onerous than say an average market rate rental because the owner is receiving federal funds. In other words, they can’t simply evict everyone onto the streets that are currently residents……until 2020 when the federal funding ends. Sounds like the company is going to try and work with the City/Fed to ‘help’ find alternative housing for these residents but they are under no obligation to do so after 2020. @Olga, that is SR-79-16 apartments. They own few tracts and are also owner of SR-78-16. You can search development plans on IMAPS click on development layer then search plans on raleighnc.gov Raleigh’s site should learn from Apex’s interactive development map which with one click pulls up the plans. Apex, who has about 1/20 the number of building plans submitted and 99% of them are cookie cutter look-alike houses. Garage on the Left or Right doesn’t’ really require sophisticated software. Word on the street is that the Boylan Flats now under construction in Glenwood South will be converted from apartments to an extended stay hotel. Word on the street is that the Boylan Flats project now under construction in Glenwood South will be converted from apartments to an extended stay hotel. @TheHightHawk & @Thomas, I believe the Owner is using HUD money and Low Income Tax Credit funding for the Sir Walter renovations. It is going to remain housing for seniors. Wake is adding 64 people a day (including births, deaths, and people moving out). If you say another 36 coming to Durham and Chapel Hill, (which I think is low) that is 100+ new people a day added into the triangle. they are saying Wake will be at 2 million by 2050. That’s not what is happening at all. That’s what the current owners have done over the years but the building is under contract by an Ohio company that specializes in revitalization of historic buildings just like the Sir Walter.. every indication so far is a major rehab AFTER the low income folks are moved out in 2020 I believe. Word is they are talking with the owners of the Sheraton about a potential larger development. TBJ has a nice article summarizing the progress and timelines for the parts of the Dillon. There’s no mention at all about Urban Outfitters. Does anyone have any information about that? Did it get dropped? @Thomas, All I can say is that there is an agreement to sell the property and the new owner will renovate it and keep it senior housing. The agreement could fall through, but it hasn’t as of yet. While I’m not advocating kicking these folks out on the streets, leaving this building as some sort of low or even moderate income housing versus a revitalized hotel is a HUUUUGGGEEE missed opportunity for the City. Go to Richmond and see the Jefferson and tell me if they should have kept it low-income housing which at one point, it was is my understanding. The Peabody in Memphis is another example of what the Sir Walter COULD be. @Thomas. The Jefferson and Peabody are awesome. Thanks for sharing. Would love to see something similar for Raleigh! I’m not arguing for keeping it senior housing. I’m just reporting what I believe to be happening based on the information that I know. I would love for it to be a grand hotel again. I will say that it is a different ownership group looking to purchase the building than what is reported in the N&O article. Thomas a decade ago or so, someone bought up that 4 story building with castle-like facade and mentioned combining it with the BB&T-Sheraton Lobby. They used words in an article along the lines of ‘this land is too valuable to just be air space (referring to the Lobby obviously). I assume the rumor you mentioned is tied to that long ago article, but I don’t know. It would be interesting to rip out the Sheraton and put something much better in there. Interestingly we are in the age of very tall buildings being imploded now (NYC has a 52 story one proposed to come down and Frankfort KY just imploded a 28 story building), so it wouldn’t be too unusual to blow up an aged-yet-modern-and-very-plain-square-box for something else. FYI re: the Courtyard project, TBJ indicates it’s a fall 2018 groundbreaking. Transfer Co. Food Hall is nearing completion. The walls of the Saxapahaw General Store are being formed right now. I’m gonna go out on a limb and say the Food Hall portion of the project will probably open before Morgan Street Food Hall at this point. @Kevin, can you provide link to article?